UMass completes the sweep in Orono with a 4-3 win, once again led by captains Justin Braun and Brett Watson. Full recap will be tomorrow. UMass finishes the regular season tied for 6th and will take on #2 seed Boston College at Conte Forum in a three game series next weekend. Win and you’re in. Almost. 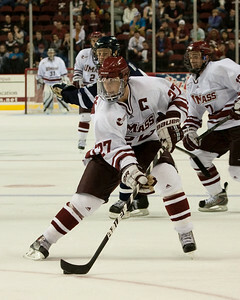 That’s the scenario UMass has setup with their 5-2 win last night. I can’t comment too much on the game itself since I was unable to follow it. I love the fact that the Minutemen didn’t just come out and play ok, they seem to have dominated Maine from the get-go with a T.J. Syner goal just 52 seconds in helping them establish a 4-0 lead at one point. After all that has happened this week, it’s great to see the team come together. I’m also please to see that the defense had another good game and that Doug Kublin was back in the lineup. He’ll be needed tonight and hopefully beyond. Let’s get straight to the playoff scenarios. UMass can finish anywhere from 6th to 9th at this point. It is still possible for UMass to win tonight and not get in, due to the way mutli-team tiebreakers work. Maine is likely not going to just roll over tonight. First off, it’s Senior Night (though they have only a few seniors). But more importantly, home ice is now on the line for Maine. If they lose and BU and Lowell both win then the Black Bears will be on the road for the quarters. I’m sure they’ll do everything they can to avoid that. It should be a dogfight tonight in Alfond. With the season on the line Justin Braun stepped up and notched two goals and an assist, finishing with a +4 on the night. That’s exactly what you want to see from your captain. Here’s how things looked for the Republican writer. USCHO has a recap as well. WABI has some video highlights. Yesterday I mentioned Alex Berry was sent down to Reading in the ECHL. Not entirely true. He did play a game for the Royals because they were short on bodies but has already been recalled back to the Marlies.